The Madison river is the best known river in the state of Montana. The words Montana and Madison river are as American as baseball and apple pie. More has been written about the Madison river than any other river in the state. The Madison river offers a variety of water for a variety of anglers. Starting inside Yellowstone National park, the Madison river is formed by the Gibbon and Firehole rivers converging. Once it leaves the park it flows into a huge reservoir named Hebgen lake. 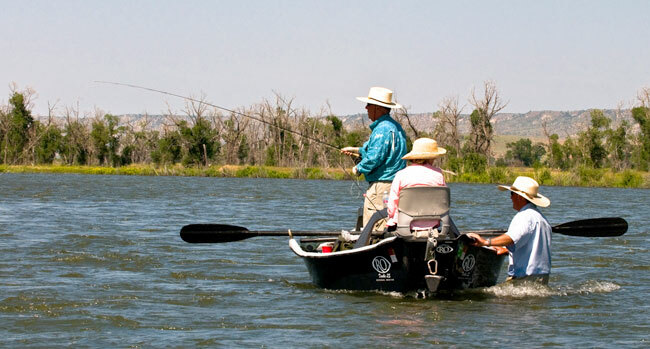 Hebgen lake can offer great dry fly fishing in the summer months for stillwater enthusiasts. The Madison river picks back up below the dam for a short distance. In 1959 a 7.5 magnitude earthquake rocked the area causing a giant landslide that formed what is now known as Earthquake lake. The Army Core of Engineers quickly punched a hole through the rubble to release the water. From this point on to the town off Ennis this 50 miles of the Upper Madison river is known as the 50 mile riffle. The river is relatively shallow as it rolls over a boulder strewn river bottom. This is the most popular section of river hosting a great variety of western hatches year round. The Madison river empties into another reservoir named Ennis Lake below the trout town of Ennis, Montana. This is the last dam on the Madison River before it meets up with the Gallatin River and Jefferson River to form the Missouri River just outside of Bozeman, Montana. The river changes characteristics to more of a tailwater river than the classic freestone river, it is above Ennis. For the next forty miles the river meanders at a slower pace over shallow weed beds. This is a popular area for recreational floating and during peak summer months the lower Madison River can be very populated with coeds and families enjoying the Madison River. Some of the largest trout in the river are located in this section but the numbers of trout are not as dense as in the Upper Madison stretches. 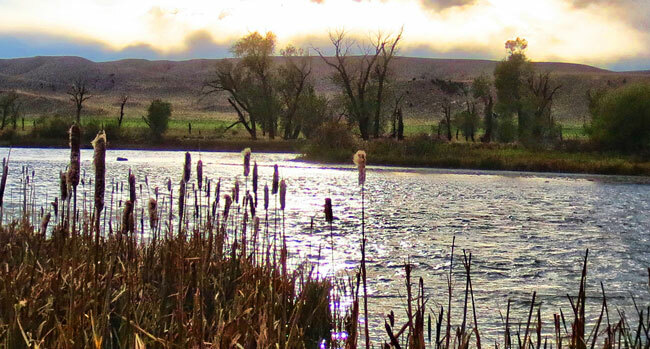 During the winter months we concentrate fishing the lower portion of the Madison river. Within an easy drive to the river, the Madison river can provide great midge hatches and dry fly opportunities when the conditions permit. The Upper river closes to fishing from Quake lake to MacAtee bridge at the end of February. It opens again with the general opener on the third Saturday of May. The lower section of the Upper Madison river above the town of Ennis also predominantly freezes over during the winter months making float fishing impossible. Spring fishing can be quite good on both upper and lower sections of the Madison River. As the first major hatches of blue winged olives emerge the fish come out of their winter hibernation and actively start feeding on both the dry flies and the nymphs. More and more hatches start to emerge such as the famous "Mother's Day" caddis hatch as the water continues to warm up. Strong baetis hatches (BWO's) are also predominant during this time period and a mixture of nymphing and dry fly fishing is productive. 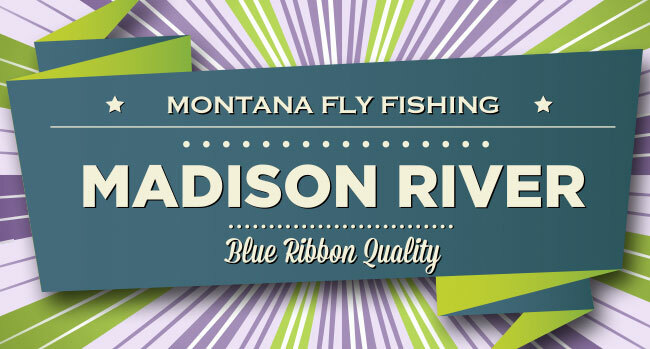 One of the most famous hatches that bring anglers from all over the river to fish the Madison River is the famed Salmon fly hatch. Generally starting near the end of June to early July the river and foliage comes alive with these 3" insects and the trout gorge themselves until they cannot fit another bug in their mouth. Fishing with these huge dry flies is not only exciting but visually stimulating. Once the hatch has ran its course up river then we start using more terrestrial patterns such as grasshoppers, beetles and ants. Hatches of assorted mayflies and caddis continue through summer months providing ample dry fly opportunities. As the trees begin to lose their leaves, the brown trout prepare to spawn and become super aggressive. 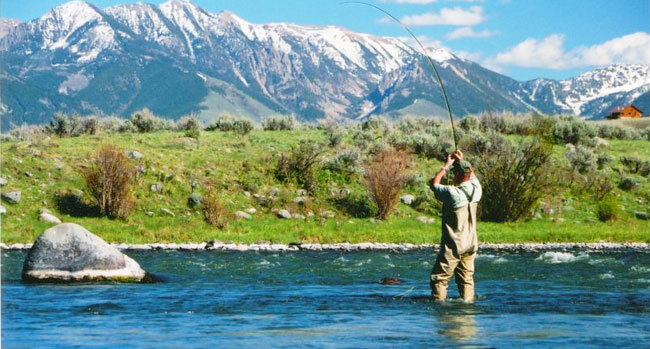 This is prime time streamer fishing on both the Upper and Lower Madison river. Covering as much real estate as possible with big ugly streamers can draw explosive strikes. Many of the largest fish of the season are netted during this time period. If you are willing to put in the work, you have a chance to catch a wild trout of a lifetime. There are many appropriate flys to choose from on the Madision River. These three flies are focused around a springtime hatch. Craven's JuJu Baetis. Most commonly known as Blue winged olives or baetis this small olive mayfly can be found on all our area rivers and streams. The fly is a fairly new pattern being used on the Madison. Craven's juju baetis is a great pattern for tailwaters and slower moving currents. This slender profile fly is a great pattern to fish for difficult trout or to sight nymph with. Without a beadhead, I like to fish this with a dry fly suspending it just under the surface. BWO Cripple. We tie a lot of these in various colors and sizes. A fairly simple fly to tie this pattern can be adapted for PMD's, Royal Wullf Cripples or any mayfly pattern you want to imitate. We've caught trout on every river we guide with this basic pattern. We believe, that because of the trailing shuck and how it sits low in the water that the trout see this pattern as an easy meal. Micro Mayfly. The pattern has been in our fly box for many years and is always a steady producer. The micro mayfly is a great pattern when the BWO's are present. It is durable, slightly weighted and a proven winner. 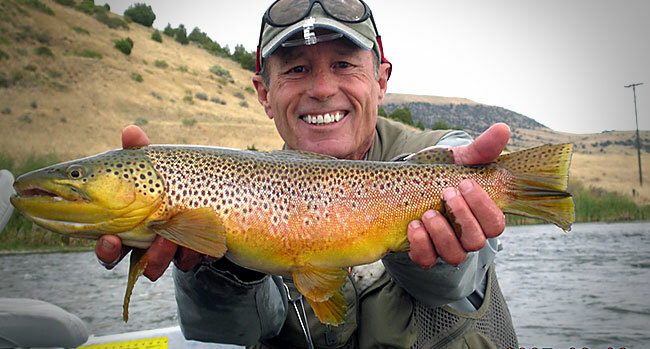 We've not only had proven success on our freestone streams like the Madison or Yellowstone but it also has a proven record on tailwaters like the Missouri and Bighorn rivers.